It was the calm before the storm after the mornings antics with look into the future tyre tech. It was time for some food and Continental didn’t disappoint with various array of food and drinks to please your appetite. It seemed I had brought the weather with me to Germany as it beginning to rain : / All fuelled up! Team Red headed out to our next station called ‘False Economy’ which showed you the difference between a Premium Vs Budget tyre. 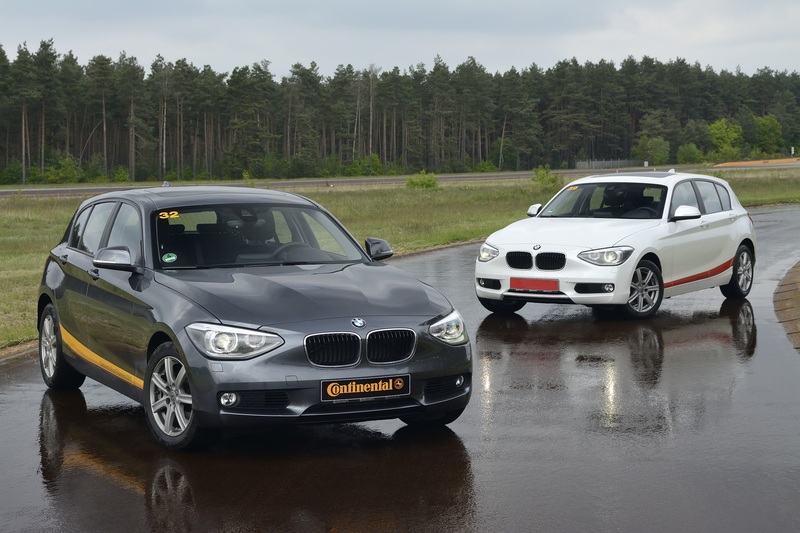 The first half of our group headed out to drive the BMW 118i fitted a budget tyre then on ContiPremium Contact 5s to feel the difference first hand. Whilst they were out hooning on the rear wheel drive BMWs my half of the group was learning about how continental develops a tyre from the compound to the thread pattern and all the research and development that goes into the process. I asked the question – What if I or tyre company copied your thread pattern would it perform the same or better? I have always been a preacher about buying good tyres and brakes as these are the only things that keep you on the road. People forget that contact patch between you and the road is only the size of your palm. 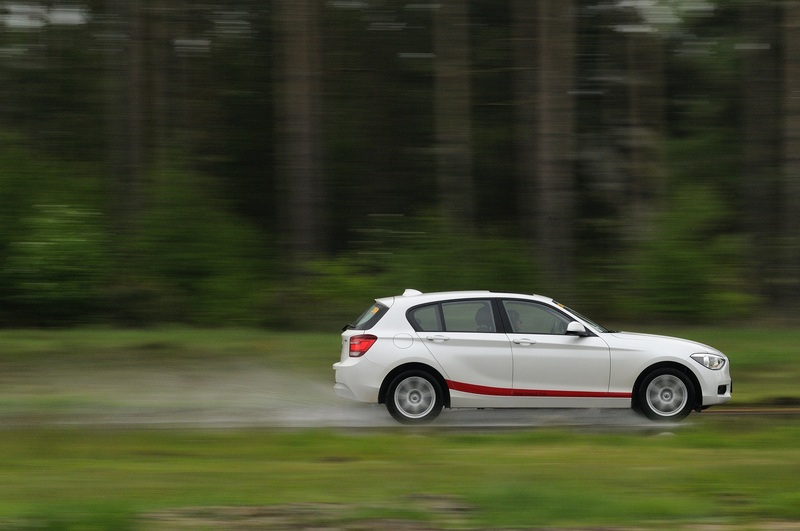 It was our time for some rear wheel drive shenanigans in the white BMW 1 series and they were fitted with cheap import tyres. I mounted my Go Pro 3 to the back window to showcase my driffftttoooo ability whilst on the wet handling track. I jumped into the driver’s seat unaccompanied and put the paddle shift gearbox and car into sport mode. We followed a pace car upfront with radios on board which talked us through the lap and how to push the tyres to the limit to feel the difference. To be honest I was being a right yob with me hanging the back out on every corner for a continuous drift. It was laughable how easy it was to induce over-steer all the time with the cheap import tyre being very loose in the wet handling track and gave no confidence what’s so ever when you pushed the car. When you reached the limit of grip you were met with snap on over-steer which is fun on track but deadly on public road. All these characteristics are stupidly fun on a closed track which makes you wonder why doesn’t someone offer a track day like this?? Joking aside these handling threats of the tyre would deadly on the open road. 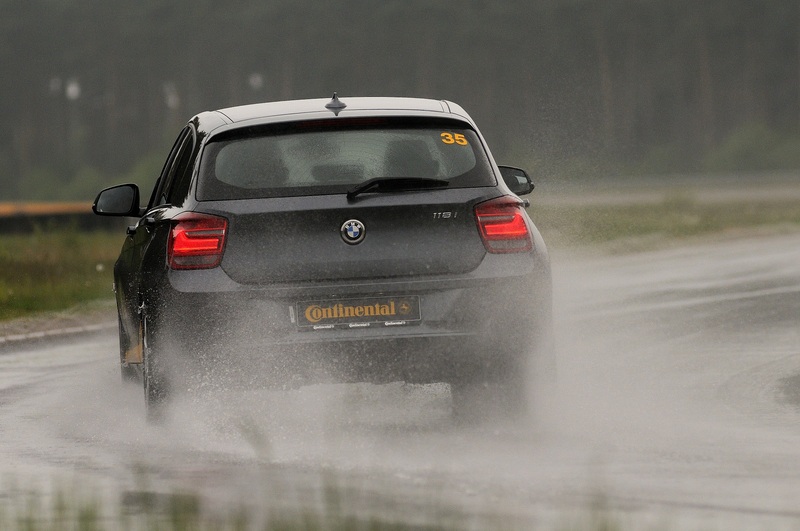 Still grinning from ear to ear fun, I suction mounted the Go Pro to the grey BMW fitted with ContiPremium Contact 5s to see how Continental’s tyres could fare better even with the worsening wet track. Into the first corner the difference was evident with the BMW front end would not wash into under-steer and the rear end refused to swing out as I mashed the loud pedal middle corner. I was being a right lunatic to get the BMW to over-steer as I had to go specifically out of my way to do it. The difference with the Conti tyre was it told you exactly before it let go whilst being controllable. It was a no contest between which tyre you would buy. We would drive 3 VW Golfs with different levels of thread – 8, 3 and 1.6 mm at different speed starting at 60 kph (37 mph) then 70 kph (43 mph) and finally 80 kph (50mph) to see the difference. My Group elected to learn the theory behind changing your tyres at 3 mm opposed towards the legal limit of 1.6 mm. 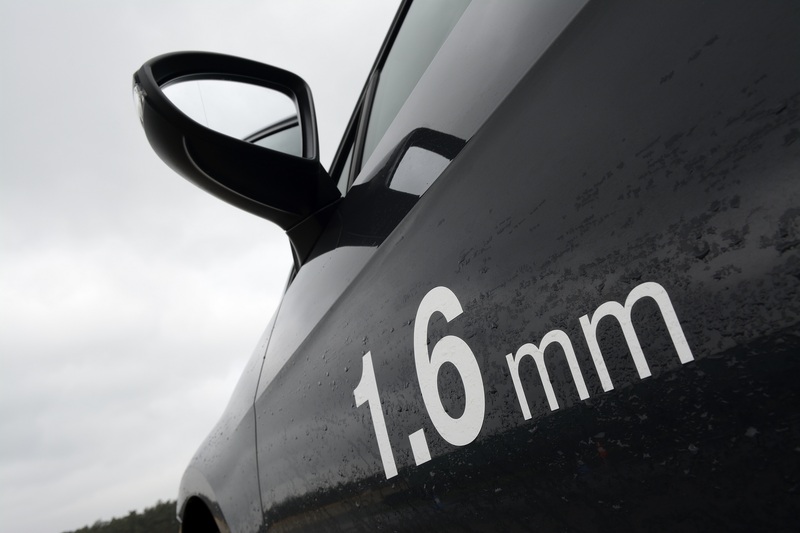 1.6mm is the legal limit for tread depth on tyres. 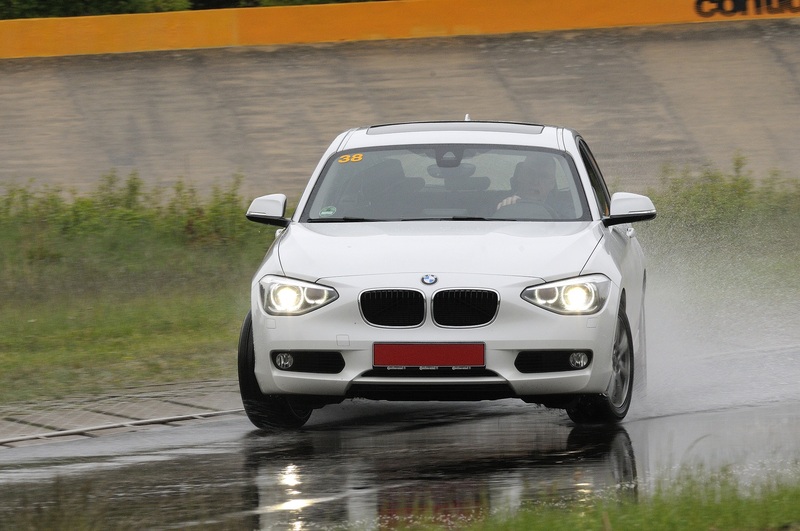 But tests show that at this tread depth, tyres are only performing at 55% efficiency, meaning stopping distances are greatly increased in wet conditions. We learnt about how the efficiency of the tyres decrease when the thread reduces and about the structure of the compound, side walls and thread pattern make a difference. With the theory dusted off we head towards the car to which there were two people per vehicle because it made easier to switch seats. I was joined by the motoring journalist queen aka Geraldine Herbert the founder of wheelsforwomen.ie who has written for newspapers, magazines and websites including the Sunday Independent. It was an honour having her on-board and we had some good discussions about the event and wider car industry. My driving skills had to be at their A game with her on board so no pressure at all. We entered the first car which had 3 mm thread and went around the oval track building our speed up to 60 kph and keeping it steady at that speed whilst we drove through about a 2 metre long patch of standing water. At 50 kph there was a slight slow down in the vehicle but nothing that really phased the tyre. Next we built up 60 kph and felt the car slow as you noticed the tyre was trying to move the water but with a slight struggle. Once again we ramped up the speed and noticed the car twitched by it moving it to the right which was nothing uncontrollable. It sort of felt like torque steer with reduction of speed of about 5 kph. The Golf fitted with 8 mm tyres was up next so everything was going be fine due to the thread depth and it was true. The car never struggled with the standing water at the different speed and the only teeny tiny difference that was felt at 80 kph even then we were pointed straight ahead. Next up where the 1.6mm tyres and me and Geraldine gave each other that look, were we we going slide into the barrier plus she elected me to do it first such a Lady. Sadly at this time we were being rushed as our allocated time at this station was coming to a close. Therefore we dashed into the other Golf and began our first run at 60kph and as soon as we went through the stand water the car aquaplane. It felt like the car was being pushed sideways I was temporary stunned by how the car acted but my reflexes kicked in with me adding opposite lock to steer the car through the cones. We looked at each after it happened and we were like ‘WOW, are you OK?’ Then the radio crackled again saying we need to speed things up so we were moving up the speed to 80kph. You should have seen my face, WHAT!! An extra 20kph (17mph) we are going hit the barrier at this speed or I am going spin it front of all these motoring journalists. Great I am gone tonight’s topic of laughter at the bar. We went back around again and I held the speed steady at 80kph and in the corner of my eye I saw Geraldine clutch the door pull so I told her ‘I got this and you got your seat belt on right?’. Around the bend we went on to the stand water and everything went into slow motion with the car being violently throw to the right like we had just been T Boned by another car. 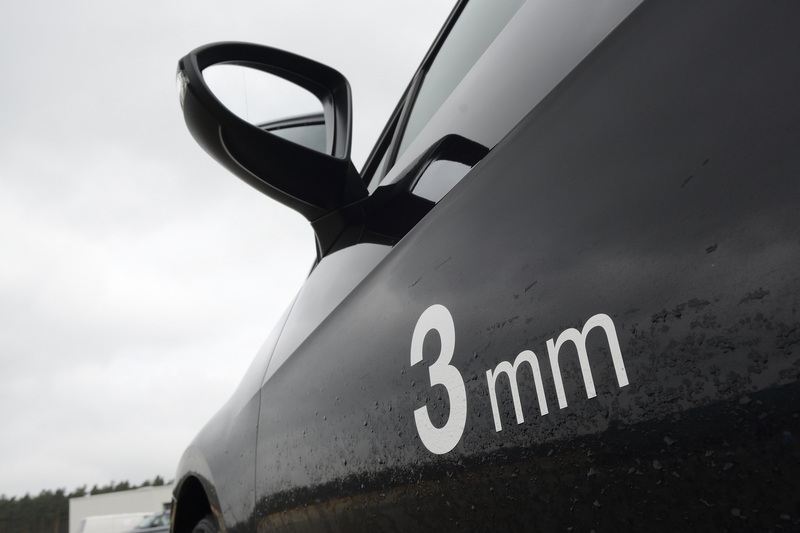 We have been drilled in by the theory test and motoring laws saying 1.6 mm is legal limit. Therefore we have been miss education to change the tyres when its close to legal limit which is completely wrong thing to do. Next up is all the track time madness I have spoken and promised everyone by telling them to wait for Part 2. 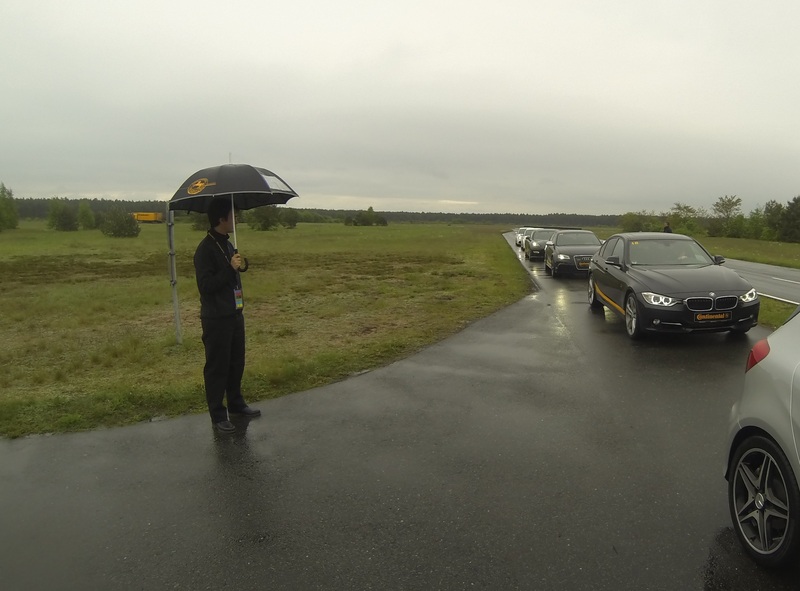 We arrived at the next station called ‘Driving Performance For You’ where there was a line up of some tasty cars – 2 x Audi RS3, A Class AMG, BMW 335i, Porsche Panamera GTS and a Porsche GT3 RS. I looked at these tasty motors and thought – ‘Oh yes time for some track action and they are not my tyres’. Someone had to come over to shuffle us into the white tent for the briefing about the performance tyres made by Continental. 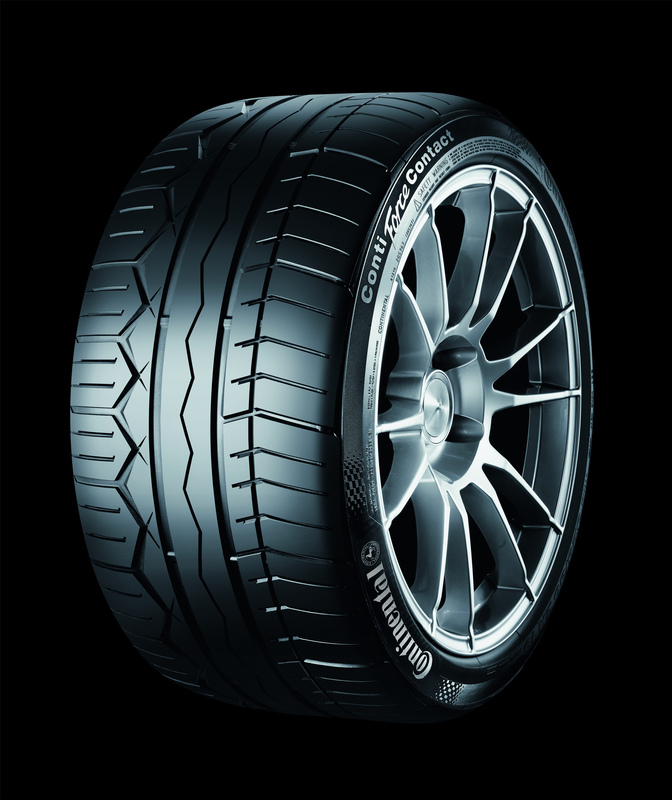 We were shown the Sport Contact 5s, Sports Contact 5P and Conti Force Conacts with the 5s being for a fast car/road tyre and the 5P being more of a lower profile track orientated tyre which can be used on daily driver but wont grip as much in the wet as the 5s given the thread pattern and compound. The Force Contacts are a track bias tyre will with them being lower profile and the compound being suited to a dry track but they were still street legal if you wish to drive around on them a daily basis. It was ironic as this was the dry handling track but it was wet and still pouring down. So I wasn’t sure how to handle the cars on a wet track with ridiculous amounts horsepower on a track I didn’t know. First up was the Audi RS3 and strangely Geraldine came with again after the ride in the Golf, I guess my recovery of the aquaplaning impressed her. I mounted the Go Pro to the back window and enter the larger leather bucket Seats of the RS3 which were very comfortable. I fiddled with the seat and adjusted the autobox to sport and put the car into sport mode and eyed up the line the track and listened to the instructions coming from the walkie-talkie. This was my 1st time in the RS model and everyone raves on about them but I honestly don’t like Audi’s at all! I actually loathe them with them all looking the same with them just being a longer and shorter of themselves with their boring driving feel and input. I wanted to keep objective so I set aside the my dislike and I hunkered down in the RS seats and gave the throttle a few blips to hear the exhaust note which was nice. Off we went following the lead car a black BMW 335i and mashed the gas pedal as soon as we left the lay-by area with the four-wheel drive hooking up and all 335 ponies from the forced induction 2.5 litre TFSI engine propelling us forward with a jot to push us back in our seats. I went into the first bend all cautious as I wasn’t sure about the how the car would handle in the wet but I soon realised that you didn’t have to do anything but press the loud pedal as the car did everything and all that was left was for you point the thing in the right direction. The Audi was quick with it reaching 140kph on the back straight but my god was it boring it drive with no feedback to the wheel at all. I could have driven it one hand and texted my mates to telling them what I was doing and take a few snaps whilst I was there. 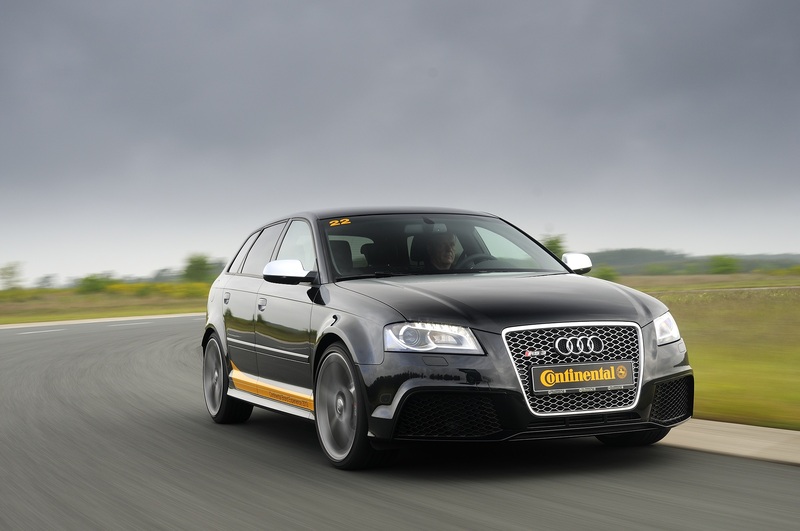 I left the AUDI unimpressed by its driving feel and here is my summary of the car – If you want a point to point fast car the RS3 is perfect, actually it should be THE getaway car of choice if you want to rob a bank. If your after driving involvement, road feel and laughs then don’t buy it, sure it fast but it’s so uninvolving I would rather go shopping for door mats. Into the much incapacitated A Class AMG which had nice subtle menacing look from the outside and was very tasty inside. SLS AMG air vents and carbon fibre look dashboard with some nice subtle red accents around the cabin. So far good, I looked to the console to turn everything on to get it to sport mode which took a little longer than I like but minor grumble given the performance on tap. Now I would have another 4 wheel drive vehicle but with 2 litre four banger developing a laugh out loud 355 BHP. Again this would be my first time driving the hot version of normal Mercedes as I had only driven the C Class CDI C220 a while back. I have always wanted to drive an AMG given how loony the division is with copious amount of power they extract from engines and the noise they make which sound like the heavens have opened up and THOR has arrived. Again I blipped the throttle to her what she sound like but it was slightly muted but I wasn’t sure about the reason given how new the car was but meh. Off we went around the track again with me being directly behind the lead car so I could push on more as we would setting the pace of the other cars behind us. Straight way I felt the AMG feel more eager to rev and pull harder in the corner but I didn’t like the driving feedback but it was significantly better than the RS3. I had a lot more fun the AMG with the feedback and it was more playful with it reaching 147kph on the straight way which made me wonder what it would be like in the dry. I left the AMG impressed as this was their first proper attempt at hot hatch and I would definitely recommended one over the RS3 as its faster and roughly the same price – WIN WIN!! Next up was the blacked out BMW 335i which looked menacing as hell and me being brought up in BMW and owning a 323i for a while I looked forward to testing performance variant of the 3 series. Into the 335i I went with a big grin as I knew some sideways drift action would have happening with the rear wheel drive power. It’s very dangerous coming out four-wheel drive vehicles as you got used to giving the car full throttle mid corner. This pre mindset was evident in the first corner where I pressed the loud pedal mid corner resulting in the back-end of the BMW going into 60 degree slide then finally me realise and catching the slide with opposite lock and powering out of the corner. I looked over to Geraldine and said ‘Do not worry I will make sure we will stay on track as I know you have two kids but I will be pushing it hard’. 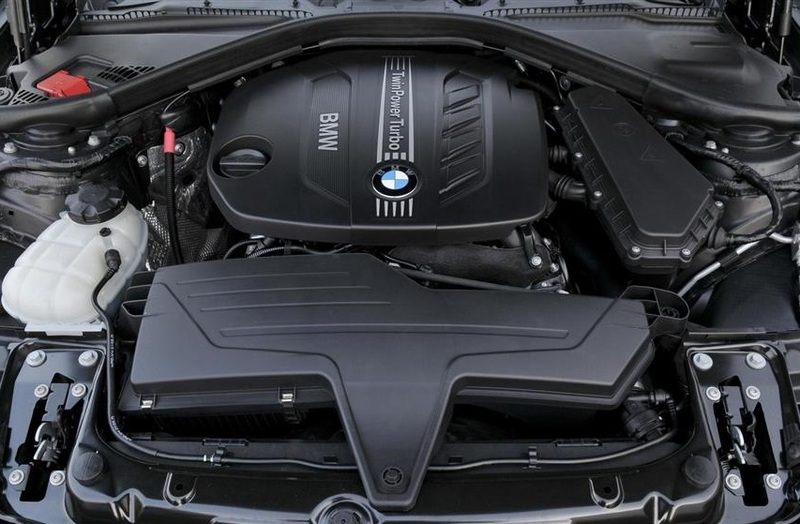 I proceed to get use to the 335i making sure I was getting the most out of the turbocharged 3 litre in-line six developing 300bhp and 300lb ft of torque to tail happy rear wheels. It was quite tricky getting used it due to the conditions of the track and the seat time I would have. This is what made it way more fun than the Merc or Audi as you the driver had to work learn the cars behaviour and find the levels of grip instead of the electronic nannies and clever four-wheel drive vectoring power behind the senses. The BMW was the quickest on the back straight with an indicated 160kph but the brake pedal feel was worrying as the consecutive pounding was showing in my time around in the track. Minor grumble as this isn’t a fully fledged skunk works of the M division unlike the RS & AMG as I am sure the forthcoming M3 would have power slided to victory. Time was now running short and I had to make a tough decision drive the Panamera GTS with Ferocious V8 putting out 430BHP or jump into the Porsche GT3 RS for some hot laps. 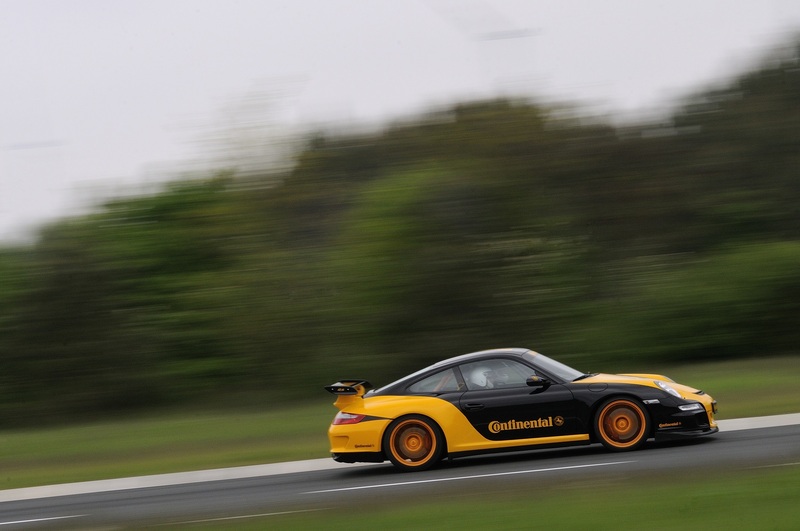 By the time I had decided to take the GTS some had nicked it from me so GT3 RS was awaiting me to dawn a racing helmet and to climb through the full roll cage to hunker down into the racing bucket seats. 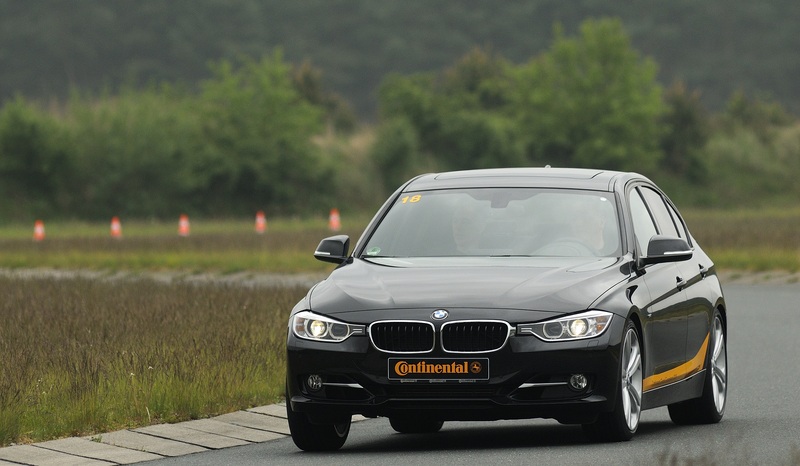 I gave the thumbs ups to the driver who actually worked for Continental on tyre development. Off we went and hell he could drive with his braking and feeding the power in and never letting the power being wasted even in the wet. Not once did miss a clipping point or apex and he drove the GT3 RS like the track was dry. 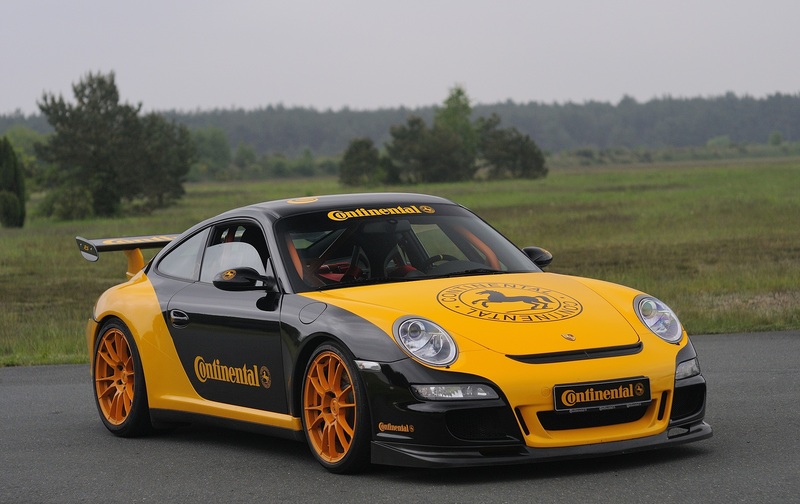 The GT3 RS was fitted with Conti Force Contacts. I was told later he is very fuss about driving as drove the track first early in the morning and adjusted his tyre pressures then went back out again. When it rained during the day he took it out again to find the better line in the wet and adjusted the pressures again. I got told by the guys that Mercedes C63 AMG would have been out today buy didn’t due to the rain as it would be too lairy, plus the other day one person decided to leave the track in one and go off-road. Typical I have always wanted to drive one as well. The next experience was up next called ‘Chill Out’ but I didn’t think we would be literary chilling out as we were taken into the where the winter tyres were tested. 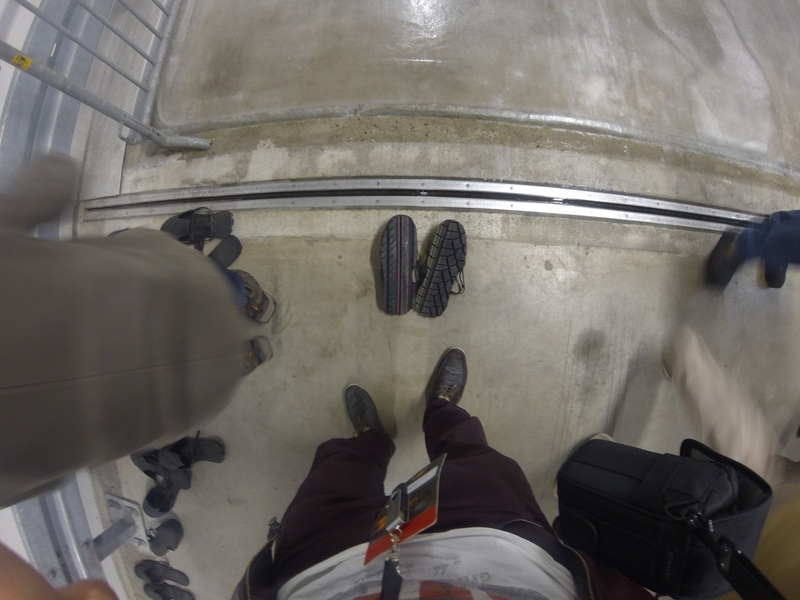 It was freezing in the testing area and we were told now how a winter tyre were made. The silica is key to grip in temperatures below 7 degrees due to the properties of it being a soft compound and the tyres have snipes/groves to increase traction on snow or ice. Continental had a novel way of showing you the difference between a normal tyre and winter tyre with slippers. Yes slippers!!! They had made slippers out of a tyre which looked amazing when you flipped them over – 1 slipper was a normal tyre and the other made of a winter tyre We all rolled out to get our slippers on to the long sheet of ice and you felt straight away when you stepped on the ice with one leg sliding forward to rip your trouser and your other leg staying put like it was glued to the floor. My left leg had a mind of its own on the ice and it was good thing I wore slightly baggy chinos at the time. The day was coming to close at 5 and we were all called back to the press room where last parts of the brand experience would happen. We would sit down and listen about Continentals history and developments/partnerships through a presentations. 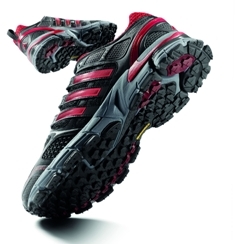 We learnt how Adidas approached Continental for their expertise to develop a outsole with a strong grip ideal for trail and outdoor sports shoes. The first range of trainers with Continental technology was the Adidas SuperNova Riot 3, featuring Continental’s Traction Compound Technology – which allows confident grip on all surfaces and conditions. Continental has strong brand relations within football industry with sponsoring the UEFA Euro 2012, FIFA World cups and Champions league. 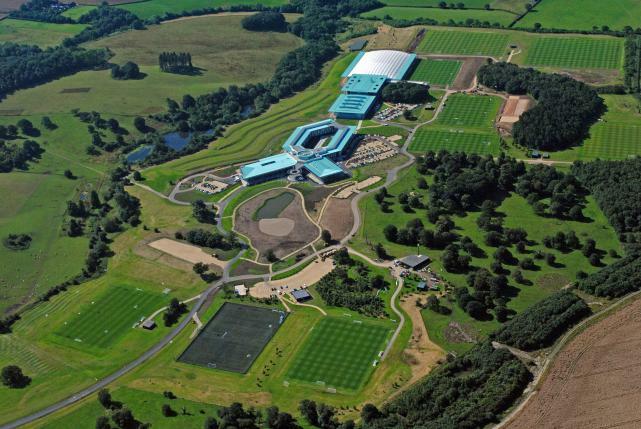 Now most recently with St. George’s Park, the national football centre in Burton-upon-Trent. The new partnership will see Continental Tyres become an ‘Official Supporting Partner’ of St. George’s Park. With a focus on preparation for driving performance, the Continental presence at the National Football Centre will include a 60-metre indoor ‘high performance’ running track, a goalkeeping ‘stopping zone’ and a bespoke ContiWarmUp area to enable all players to prepare before a game or training session. I have personally visted the grounds and I was genuinely astonished how gigantic they place. You have to drive down a short road network and then it all opens out to Hilton Hotel and the training grounds with 5 areas of parking. Continental has been a partner in excellence with Mercedes-Benz World Brooklands by supplying them with tyres for both on and off-road driving experiences. The Brooklands site offers an interactive world full of the passion, heritage, values and innovation of the Mercedes-Benz brand. 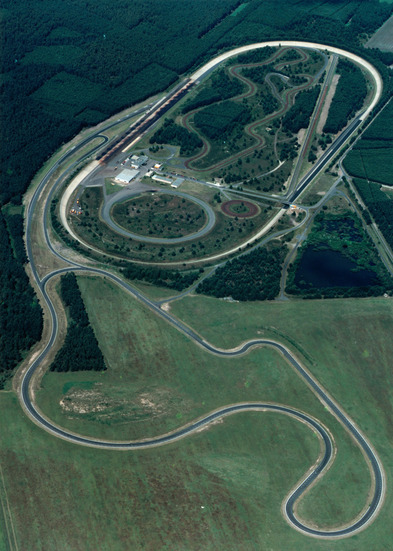 These include a wet circle and a 10-acre off-road course, a high-speed handling circuit and acceleration and braking strips. The final presentation of the day was about all the compounds that go into a tyre and how some are natural, synthetics, oils, rubber and how various elements are added to give the tyre compound different properties. 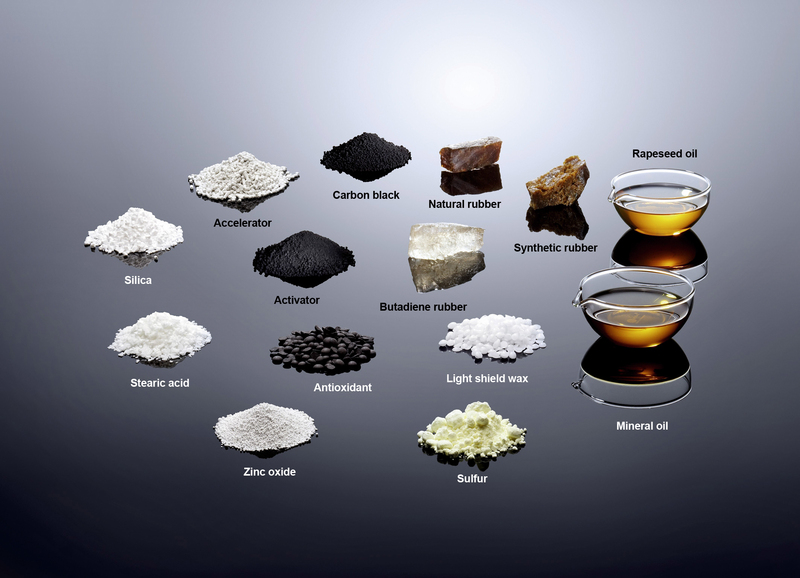 A tyre is a complex high-tech product made up of up to 15 different compounds. Each compound contains 20 ingredients and up to 30 different components. The tyre is not just made up of rubber compounds; engineers also employ reinforcing materials such as nylon, polyester, rayon and steel to perform varying functions depending on where they are used. For example, nylon and steel cords are used under the tread to restrict tyre distortion and minimise heat build-up in the tyre, whereas rayon or polyester is used in the plies to withstand the inflation pressure of the tyre. The brand experience was over so we headed back into the coach and head back to the hotel to freshen up for all us to head back out to have dinner together. We went to a local restaurant in Hanover which was couple of kms away which was nice and where I spoke with other motoring journalist about the experience we had during the day and the other events they had been to. It was a pleasant way to end the antics over the 3 days. Thank you Continental for inviting me and I had good laugh on the experience and went away with in-depth knowledge about tyres and stories to tell for years to come. But don’t worry Germany I will be coming back soon….